As a followup to a previous bog (which you can read HERE), this post continues the theme of Zen gardens located in Kyoto's Daitokuji temple complex. This time, we'll be looking at two more temples that feature unique landscapes and special cultural treasures. Each of these temples also have some nice connections to the world of Japanese tea, so lovers of tea and the aesthetics of the accompanying ceremony will find things to be excited about as well. We don't usualy feature these gardens in our regular Kyoto tours, but you can see these for yourself on a private customized tour. Up first is the small Zuiho-in Zen temple. Even though it's one of only four temples open to the public year-round in Daitokuji, this one seems to get skipped over by many tourists, as it's off the main pathway that winds through the center of the temple. Yet inside the gates of this temple is a surprising blend of the traditional and modern. The two gardens on opposite sides of the hondo (main hall) were both designed by Shigemori Mirei, perhaps the single most important scholar and designer of Japanese gardens in the modern era. Mirei - whose gardens deserve their own blog post one of these days - was a master at working with larges on a grand scale. Not afraid of creating vibrant and sometimes violent landscapes out of sharp stones and jutting peaks, Mirei's landscapes are far more dynamic and engaging that the more austere typical Zen rock garden. Created in the late 1960's, the main garden is alive with sharp angles and sweeping vistas. A tight gathering of peaks and ridges rises rises out of the sea to form a vision of Mt. Horai, the legendary mountain of paradise in Chinese mythology. The white gravel that makes up the ocean surrounding the towering summit is raked aggressively, with the waves raging in deep trenches and peaks. Mirei has presented us with a seascape that feels - in my opinion - more alive than any other Zen garden in Kyoto. Most allegorical Zen gardens like Daisen-in present a calm snapshot of a scene as it meant to be imagined in the mind's eye. The garden at Zuiho-in isn't just a freeze frame - the waves seem to ebb and flow before your eyes and the stones seems to stretch and groan as they strain higher towards the clouds. For a stationary diorama of stone, it certainly has remarkable dynamism and activity! One the other side of the hondo is another unique garden designed by Mirei that illuminates the special individual who founded Zuiho-in. Sorin Otomo was a powerful samurai lord who acted as the financial patron of Zuiho-in and followed Zen Buddhism until his conversion to Christianity in 1578. His motives for conversion and how closely he adhered to his new faith is up for debate, and for centuries Christianity was outlawed in Japan and the faithful had to hide their religion from outsiders. The secretive nature of these believers inspired Mirei to add a certain special twist that would only be visible to certain viewers from just the right angle. What secret symbol is hidden in the layout of the garden's rocks, and what special object is buried under the stone lantern? Come along on a tour with us at KyoTours Japan and find out for yourself! One more unique feature of Zuiho-in is the traditional tea room hidden within an adjoining building near the main hall. It's actually a set of rooms, that progress from an open reception area to a cozy, personal space where the tea ceremony would take place. This presents an interesting architectural dynamic, and the rustic feeling of rough walls and exposed wood grows as you approach the inner chamber. Even if you're just visiting to see the garden, the tea area is a nice illustration of traditional architecture and design that is definitely worth checking out. Moving away from Zuiho-in's modern interpretations of Japanese culture and history, we come to Koto-in, a very secluded Zen retreat located on the edge of the Daitokuji complex. The entrance to the temple features several long pathways through different types of forest. Bamboo, pine, and hedges all line the way as you're transported out of the city and into a lush world of shady greenery and quiet groves. The temple itself is divided into two halves with very different themes. The south section houses the religious areas - the main hall with its Buddhist altar and smaller rooms for meditation or meetings with the priests. The main area looks out onto a Zen garden that might surprise many visitors. It's not the typical landscape of raked stone that usually comes to mind, but instead simply a wide expanse of green moss against a solid background of trees. With its lack of distraction and simple aesthetics, followers of Zen find this sort of landscape perfect for meditation. On the north side of the temple is a series of buildings that hold interesting secrets connected to the practice of tea. As the father of the tea ceremony, Sen no Rikyu (read more about him and his philosophy HERE) left his mark all over the city of Kyoto. A set of rooms called the Ihokuken is preserved at Koto-in, and it's said that Rikyu once resided here for some time while perfecting the process of the tea ceremony. You might not guess it now, but the walls here were once bright gold, now faded over the centuries into a dingy pall that still has a certain charm. The Japanese respect for natural ageing and the process of decay is certainly on display here. Between the two wings of the temple is a lush landscape that may seem overgrown and wild to the untrained eye. But this is a roji 露地, a tea garden, written with the characters meaning "dewy path." 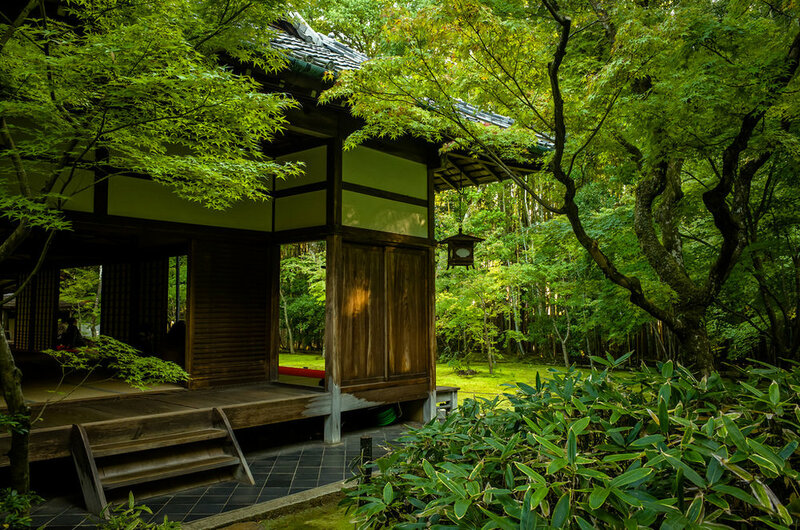 Not content with just a simple walk through a garden to reach the tea house, Sen no Rikyu deemed it appropriate to make a special journey through a landscape that would remove you from the earthly world and into a realm of mossy delight and dewy tranquility. 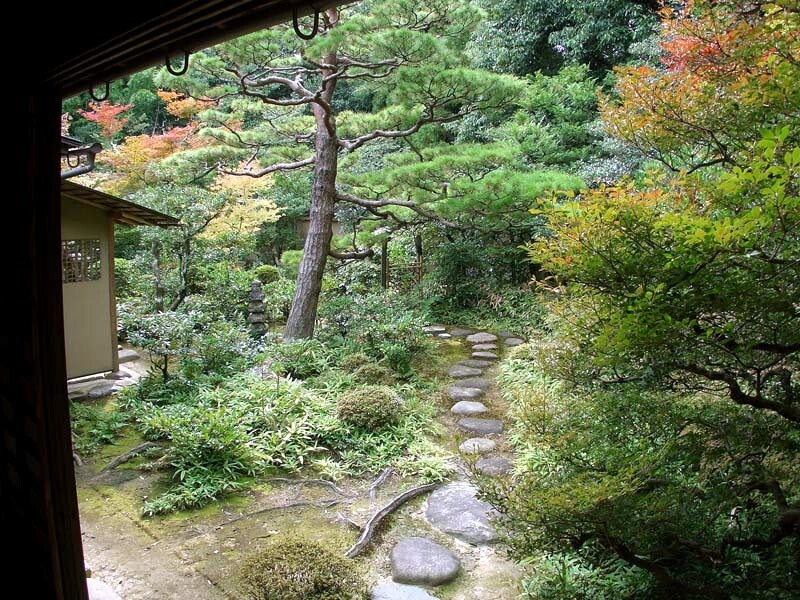 Paths in roji are never a straight line, always twisting and turning through the garden to create the image of a journey not only through physical space, but into a new mental state as well. The roji at Koto-in is one of the finest in Kyoto, with just the right amount of the other-worldliness and mystery that Rikyu sought to prepare his guests as they journeyed towards his tea house. Beyond the tea garden lies a small plot of graves that holds an interesting story. Tadaoki Hosokawa, the\original patron of the temple is buried here, as is his wife. She took the name Gracia upon converting to the new Catholic religion in the late 1500s, and he story is quite an interesting one. Hosokawa proved his love to her by not only allowing her to convert, but by standing by her side despite her family ties to the man who killed Hosokawa's lord Nobunaga. Faithful to the end, she went to her death in service of her husband, and is buried by his side in the garden. Hosokawa's grave is marked by a lantern given to him by his tea master Rikyu, and was chosen to stand at his gravestone to show his dedication to the tea ceremony even after death. Despite the strong elements of tea and history at Koto-in, the simple main garden stands in fine contrast to typical Zen landscapes, and the roji tea path is one of the most picturesque in the city.